ONE stands for Ocean Network Express. The Port of Long Beach welcomes ONE. JV consolidates container shipping units of three companies. For three Japanese ocean carriers combining their shipping container business into ONE, the future is bright and it comes in magenta. The future arrives this month. ONE stands for Ocean Network Express, a joint venture of “K” Line, Mitsui O.S.K. Lines and NYK Line that consolidates the three companies’ container shipping units into a single, integrated company. ONE chose the vibrant mix of purple and red to convey the energy and excitement of the new business model with a color that pops amid the muted blue and brown containers crossing the docks. “We have this moment to combine the best practices of our former companies with new technologies to support our customers,” said Maria Bodnar, Senior Director of Beneficial Cargo Owner Sales for ONE North America Inc. in Richmond, Va. The regional office is one of five supporting ONE’s global headquarters in Singapore. At the Port of Long Beach, ONE customers also will benefit from the fact that “K” Line, one of the three legacy lines, has longstanding operations and investment in International Transportation Service (ITS) Inc., Bodnar said. ITS operates the 246-acre marine container terminal at Long Beach’s Pier G where ONE vessels call. Formed in July 2017, ONE has an integrated fleet deployed in all major trade lanes with service to more than 100 countries. The new venture has emerged as the world’s sixth-largest international shipping company, with more than 1.44 million TEUs (twenty-foot equivalent units) of containers, including 10,000 new boxes in ONE’s branding colors of magenta and gray. An additional 100,000 new containers are on order, and all new ships entering ONE’s fleet will sail with magenta hulls. ONE’s network operates more than 250 vessels, including 31 container ships with 14,501-TEU or greater capacity, and connects shippers to more than 200 of the world’s major ports. ONE also remains a member of THE Alliance with Hapag-Lloyd and Yang Ming, continuing the vessel-sharing relationship previously established with each legacy line. Since February 1, ONE has been taking bookings and signing contracts. Containers are being staged ahead of service starting this month. ONE’s new business model is a great fit with the terminal’s operations and the ongoing improvements ITS is making to add value to its services, said ITS Chief Operating Officer Sean Lindsay. The consolidation allows ITS to increase efficiencies on numerous fronts, Lindsay said. The improvements have already boosted the volume of cargo moving through the ITS on-dock rail yard to about 30 percent, Lindsay said. 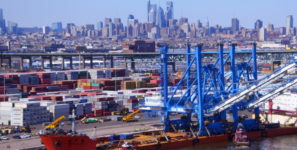 The rate exceeds the Port’s current average of 24 percent and supports its goal of optimizing operations and reducing emissions by using on-dock rail to move 35 percent of containers. Likewise, the efficiencies of ONE’s new business model are in harmony with the technology improvements ITS has made to its drayage appointment system. In January, ITS upgraded its eModal software with new features that pinpoint the date and the shift when import cargo will be discharged, five days before it arrives. The upgrade also streamlines the process for making appointments, which customers embraced. Advanced reservations quadrupled in the first month and are now up to 15 percent of all import pickups. ITS partnered with Advent Intermodal Solutions, which specializes in supply chain information technology and cloud-based software solutions, to develop and implement the upgrade. Advent operates eModal, the world’s largest software platform connecting ports, terminals and the trucking industry.